In this Photoshop Effects tutorial, we're going to look at how to easily combine reality with a rotoscope-style painting. "Rotoscoping" is the term used when artists paint or trace over live-action film, frame-by-frame, to create an animation, and it's being used in everything from tv commercials to Hollywood movies, most notably the recent Keanu Reeves movie "A Scanner Darkly". We're not going to be creating an entire animated sequence here, but we are going to learn how to give a photo that same rotoscoped effect, and it's very easy to do. Rather than applying the effect to the entire image though, which we certainly could do if we wanted, we're only going to apply it to the main subject of the image, leaving everything else in the photo untouched so it looks like we're combining a painting with reality. Use the selection tool of your choice to select the main subject of your image. Notice that I've selected around whatever it is the guy is holding in his hand, since I don't want the painting effect to be applied to it. With "Layer 1" selected in the Layers palette, go up to the Filter menu at the top of the screen, choose Artistic, and then choose Poster Edges. Go to Filter > Artistic > Poster Edges to bring up Photoshop's "Filter Gallery" set to the "Poster Edges" options on the far right. Keep an eye on the large preview area on the left to see what's happening to your image as you adjust the Poster Edges options. For my image, I've set Edge Thickness and Edge Intensity both to 1, and Posterization to 2. These settings work best for this image, but feel free to experiment with the options yourself to see if other settings work better for your image. The object is to make the subject look less like an actual photo and more like a painting. The main option here is the third one, "Posterization", which determines how many different shades of color your image will contain. Lower values tend to work best. The image after applying the "Poster Edges" filter to the main subject. Click on "Stroke" at the bottom of the list of Layer Styles to select it. Click on the color swatch to change the stroke's color. 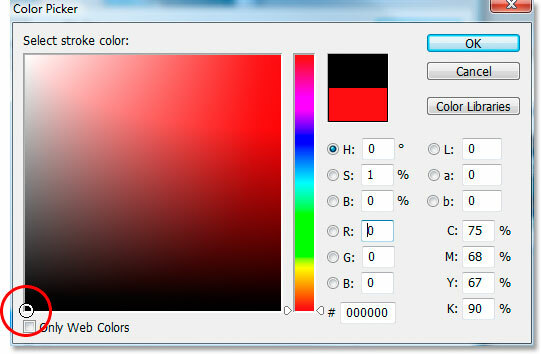 Select black for the stroke color by clicking in the bottom left corner of the large square area. Change the "Size" of your stroke to somewhere between 2-4 pixels, then change the "Position" to "Center". 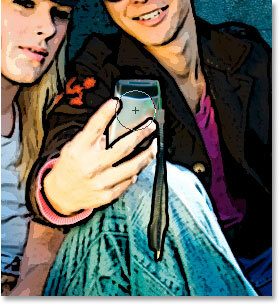 The image after applying the black stroke around the main subject to enhance the rotoscope "tracing" effect. Don't click out of the Layer Style dialog box yet. We have one more effect to add. Click on the words "Drop Shadow" on the left of the Layer Style dialog box. 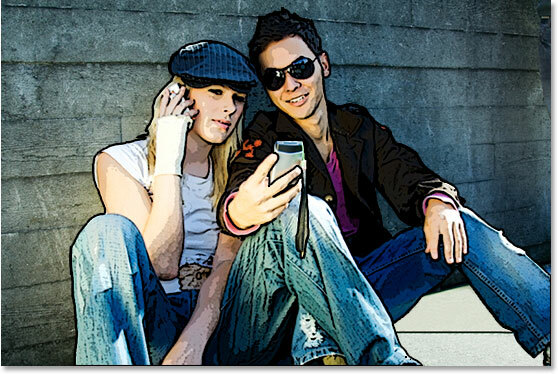 Lower the drop shadow opacity and increase the shadow distance. The image after applying the drop shadow. The image is looking good except for one thing. If you recall from the beginning of the tutorial, I pointed out that the guy in the photo is holding something in his hand, and because I only wanted the rotoscope painting effect to be applied to the two people in the image, I made sure that whatever it is he's holding wasn't included in my initial selection so that it wouldn't be affected. Problem is, the drop shadow I just applied is extending over top it, as well as the strap dangling below it, and it doesn't look right. I need to clean that up. 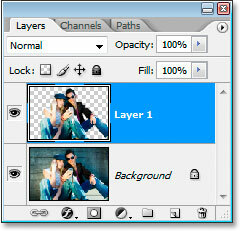 Go to Layer > Layer Style > Create Layers to convert layer styles into normal layers. Both the Stroke and the Drop Shadow have been converted into normal layers. Select the Eraser tool from the Tools palette. 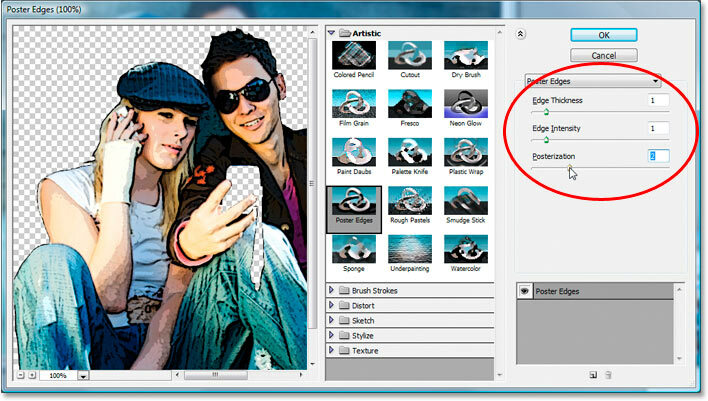 Use the Eraser tool to remove the drop shadow from any unwanted areas. And there we have it! That's how to combine reality with a rotoscope-style painting in Photoshop! Check out our Photo Effects section for more Photoshop effects tutorials!